Heat oil & butter in pan & gently fry spice mix on gas cooktop for about 3min. Add onion, celery and garlic & cook until translucent & sautéed. Transfer spiced vegetables into slow cooker. Add red & green lentils & tinned tomato (add any other vegetables you have handy at this point). Add water to just cover ingredients, & stir. Turn on slow cooker – the longer & slower it cooks the better. Never burn your spices – they are better under cooked than bitter & burnt. 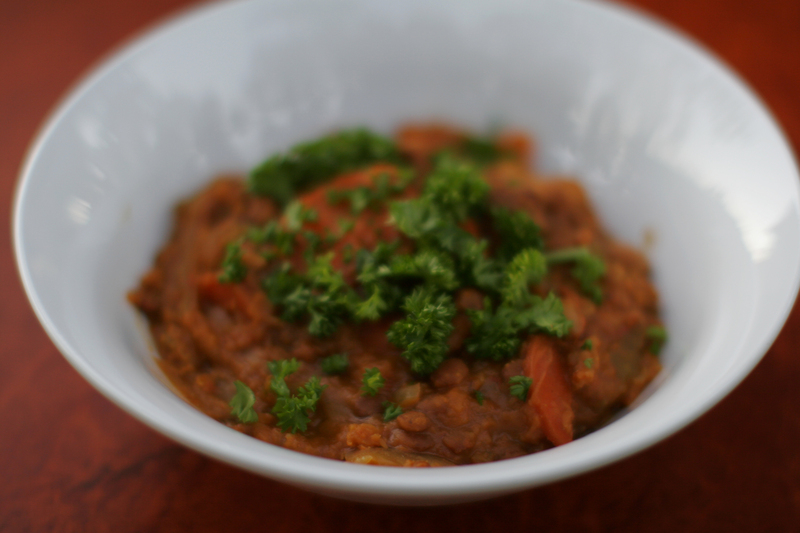 Try using different varieties of lentils. Remember if you are using bigger, harder lentils with more surface space, they need to be soaked prior to cooking in clean water for at least 8 hrs. Do not use salt in any of the cooking process, as it reacts with the lentils & they may not soften properly. A little bit of palm sugar can make for a sweeter tasting Dhal. Garnish with coriander & mint.